While you’re on Maui, you might not think about much other than beaches, mai tais, and naps under palm trees. While it’s great to relax and give your brain a break, if you have a craving to expand your horizons a bit while you’re here, there are plenty of ways to do it! Maui Ocean Center – We’ve mentioned Maui’s aquarium several times, as it’s a great place for kids, vacationers looking to escape a rainy day, or the site of one of Maui’s biggest and most comprehensive souvenir shops. One of the reasons we like it, though, is because it’s definitely an educational goldmine when it comes to Hawaii’s marine life! Listen to naturalists speak daily about sharks, stingrays, and other amazing sea life, or visit some of their interactive exhibits and learn about whale feeding, dolphin anatomy, and environmental research. Bailey House Museum – Another spot we’ve covered a bit is the Bailey House Museum, one of Maui’s oldest and best-preserved historic homes, nestled in lush, quiet Wailuku. Here, you’ll find artifacts, artwork, and plenty of information from pre-contact Hawaiian life, to the missionary era, and beyond. If your Hawaii-Certified Tour Guide piqued your interest in Hawaiian History during your tour with us, your next stop should definitely be the Bailey House Museum! Check out their elegant gift shop as well for books, hand-crafted jewelry, artwork, and more. Alexander & Baldwin Sugar Museum – Now that the sugar industry has left the Island of Maui, it’s more important than ever to remember this huge part of our history. Sugar and its production brought over countless immigrants from around the world, and they and their descendants are who make up a pretty big percentage of Maui’s residents. At this unassuming museum, right in the heart of Puunene (Maui’s sugar capital), learn all about sugar’s history, how it was processed through the years, and the huge significance of its cultivation on the Valley Isle. 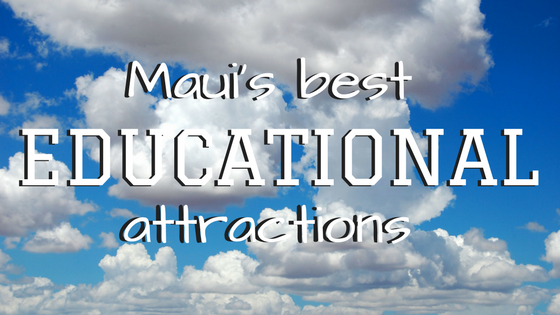 These aren’t the only spots to feed your brain on Maui—be sure to check out the Makawao Museum (included on our Haleakala Sun-Trek tour), the Hui No’eau (a non-profit art center), and of course, the Hana Cultural Center. Whether you go on a “Museum Tour” of Maui, or just bring back some cool facts about Hawaii’s ecosystems and culture from your Road to Hana adventure, we do hope you’ll return home with a deeper appreciation of Maui’s people, plants, animals, and culture!